Since 1987, Whipple Superchargers™ have been the pioneers and leaders of twin-screw supercharging. Whipple was the first to bring positive displacement technology to fuel injected, emissions legal GM applications. Since 1988, Whipple Superchargers has developed some of the most advanced and powerful GM twin-screw supercharging packages. The new supercharged LT4 engine uses a small, 1.76L roots-type supercharger which falls off on efficiency whenever increased volume is required. The new 2.9L Whipple twin-screw supercharger increases the airflow capacity and power potential. 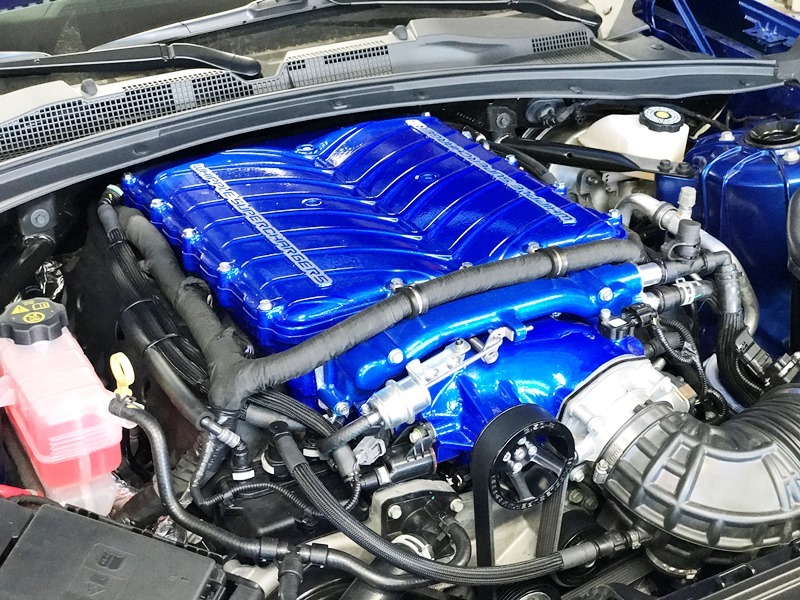 Stock engines can pickup 125RWHP with just the supercharger upgrade and calibration. With 64% more displacement, you can lower supercharger speeds nearly 6000RPM to get the same airflow! Lowering power consumption, temperature and unlocking huge power gains! With all the latest technology, the all new Whipple system makes more power than any other positive displacement supercharger system on the market giving you tire frying, neck whipping power that will give you a grin from ear to ear. The new Whipple system is available 100% complete and is designed for stock engines but has enough capability to work with heavily modified engines. The new system boast dual high density air-to-water intercooler for unmatched cooling capacity, a unique front feed upside down W175ax (a whopping 2.9 liters) Whipple twin-screw supercharger that reaches 99% volumetric efficiency and industry leading power potential. The Whipple ZL1 swap system is a simple bolt-on system that fits with existing stock air intake system, intercooler and belt system. Each system comes with all the necessary hardware for an easy, trouble-free swap. *Calibration is optional and includes an HP Tuner flash tool, along with 8 credits. *Standard throttle body adapter is made for 90mm TB. We offer a 102mm TB adapter. Select which one you need. Whipple does not supply tuning for larger throttle bodies.